The 18th century ushered in the great age of the Shakespeare edition. In 1709, Nicholas Rowe, one of the leading dramatists of his day, published the first small format edition of Shakespeare, much more portable than the earlier folio editions. Rowe also included new elements, including a biography of Shakespeare and an illustration for each play. The illustrations show Shakespeare’s characters in 18th-century dress, giving us a sense of how the plays may have looked on stage at the time. Lewis Theobald responded to Alexander Pope’s 1725 edition of Shakespeare with his own critical edition, in which he claimed to correct many of Pope’s errors. Theobald also restored the “e” to the end of Shakespeare’s name (which Pope felt was an anachronism). Although Pope criticized the work, he incorporated many of Theobald’s changes into his own second edition of Shakespeare’s works. When a noble patron presented Theobald with a manuscript of Cardenio by Shakespeare and his fellow writer John Fletcher, he revised the play, titling it Double Falsehood, or, The Distrest Lovers. Although some believed the play was a forgery, it was successful when it was performed on stage in 1728 and was printed the same year. Some scholars now consider Double Falsehood to be based on a lost play by Shakespeare and Fletcher. Alexander Pope’s six-volume edition of Shakespeare’s works reflects his own perspective as a poet. Although he was the first editor to examine original quarto editions of the plays, Pope’s interest was not in textual variants (unlike Lewis Theobald, whose Shakespeare edition appeared the following year). Pope instead focused more on mediating the plays for a contemporary audience. Pope highlighted what he considered to be the “most shining passages” or “beauties” by the use of open quotation marks and asterisks in the margins. Conversely, for the lines he thought were particularly bad, he either omitted them or else degraded them by moving them to the foot of the page and placing them in tiny type. Pope also added a number of handy indexes to the plays, including: Historical and Fictitious Persons; Manners and Passions; Thoughts and Sentiments; Descriptions of Places, Persons, Things, Times, and Seasons; and Similes and Allusions. E’er dreamt of thy good Nature or thy Wit? Stake one his Liberty, and one his guineas. Until the early 18th century, copyright was held not by the author but by the publisher, in perpetuity. Publisher Jacob Tonson held a monopoly on the publication of Shakespeare’s plays, and his trademark was literally “Shakespear’s Head.” In 1709, new legislation extended Tonson’s rights to the plays only through 1730. In 1734, the printer Robert Walker decided to publish inexpensive single editions of all of Shakespeare’s plays. Tonson sought to put his rival out of business by flooding the market with his own cheap copies. In this edition of The Tragedy of Locrine (erroneously attributed to Shakespeare), Tonson includes a notice alleging that Walker had lied about publishing his editions based on copies of the plays used by the theaters. As a result of the Shakespeare printing wars, cheap editions flooded the market, widening readership and, in turn, creating a new demand for productions on stage. A promptbook is a printed copy of a play marked up for a performance, often showing cuts to the text as well as exits, entrances, and cues. Promptbooks can help us “see” performances from hundreds of years ago. One copy of Hamlet from the Folger Shakespeare Library was used as a “preparation promptbook” (used for pre-production) for David Garrick’s 1772–73 revision of the play. It helps to establish many of the radical changes Garrick made from earlier productions: he reinstated over 600 lines (and added 37 of his own) and deleted the gravediggers’ scene, which he considered “rubbish.” Garrick’s changes gave 18th-century audiences a new interpretation of almost every character in the play. 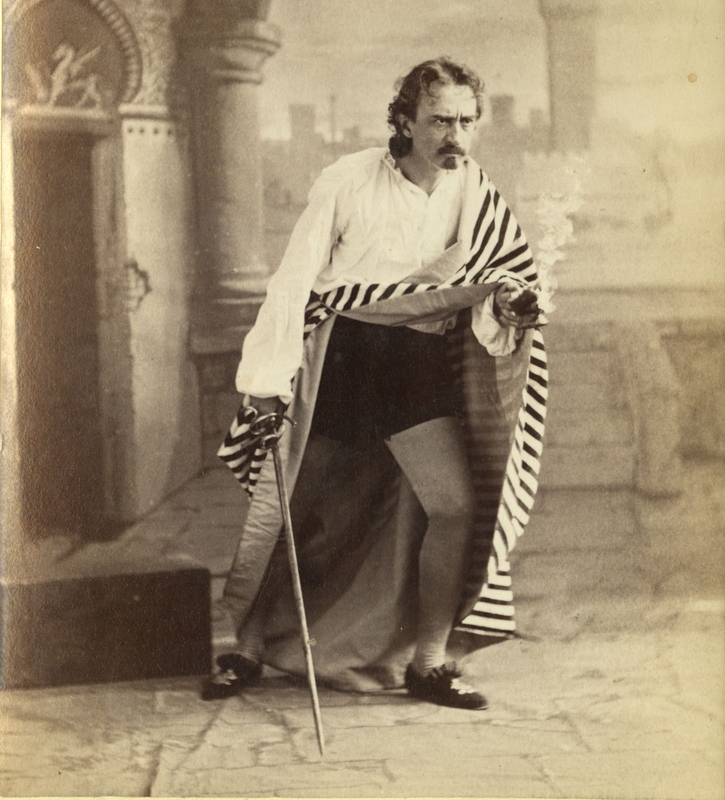 King John enjoyed popularity with audiences in the 19th century, in part because it offered elaborate, historical sets and costumes. William Charles Macready’s remarkable 1842 production at Drury Lane required the management of a huge cast: at the opening of the play, there were 59 people on stage; later, 88 actors appeared in a combat scene. A part book contains only the lines for each individual actor, with just a short cue (a few words of the previous speech) for guidance. In Shakespeare’s time, part books were used because paper was scarce and labor expensive–it would have been impractical to write out dozens of copies of a play. Even after individual printed copies of plays could be had cheaply, the practice of writing out individual parts continued. The actor David Garrick (1717-1779) exerted an unprecedented influence on the performing arts in 18th-century England, transforming himself—alongside Shakespeare—into a cultural icon. Garrick became linked to Shakespeare the moment he first set foot on stage in March 1741, in the pantomime Harlequin Student, which concluded with a display of a bust of Shakespeare. In October 1741, Garrick appeared as Richard III at Goodman’s Fields Theatre, where he was an instant success. Although Garrick’s “naturalistic” acting style would seem like overacting today, it left audiences spellbound in his day. By 1747, he was the manager at Drury Lane, a position he held until his retirement in 1776. In addition to acting Shakespeare’s plays, Garrick also rewrote them. After the Restoration, Romeo and Juliet had been largely supplanted by Thomas Otway’s adaptation, The History and Fall of Caius Marius. Garrick’s 1748 version was closer to the original, though he increased Juliet’s age to 18, cut sexual puns, rewrote rhyme as blank verse, and had Juliet awaken before she dies. After Garrick popularized it, Romeo and Juliet was performed more than any other Shakespeare play for the remainder of the 18th century. Garrick’s popularity with the public also made him a target of satire. In his novel Tom Jones, Henry Fielding includes a scene in which Tom and his friend Partridge go to the theater to see “the best player who was ever on stage” in the role of Hamlet. Partridge is ultimately unimpressed, and claims that the unnamed actor (obviously Garrick) was not actually acting, asserting: “I am sure, if I had seen a ghost, I should have looked in the very same manner, and done just as he did.” In his 1776 satirical poem, Garrick’s Looking-Glass: Or, The Art of Rising On The Stage, Samuel Jackson Pratt ridiculed, among other things, a wig that Garrick had made for his portrayal of Hamlet: the wig was attached by a tube to a pneumatic pump held in the hand; when activated, the pump made the hair of the wig stand on end. Signaling a new age of the actor as a public figure, Garrick’s public and private lives were publicized and dissected, and his image was widely disseminated and commercialized. His portrait was painted more times than anyone but King George III, and there were dozens of artistic renditions of him in his most famous roles, launching a market for artistic prints of actors. A portrait by Richard Westall (1765-1836) portrays Garrick as a rather sympathetic King Lear. Garrick was a natural subject for Westall, who, in addition to being a popular portrait painter, also contributed works to the Boydell Shakespeare Gallery in London. Garrick embraced his role in the celebrity-driven marketplace of the late 18th century, and he exploited his connection to Shakespeare. Garrick’s fame merged with Shakespeare’s own in 1769, when the actor organized the “Stratford Jubilee,” designed to celebrate Shakespeare in his birthplace of Stratford-upon-Avon. Garrick was so thoroughly identified with the Bard that he was buried under the monument to Shakespeare at Westminster Abbey. After his death, Garrick remained popular and even figured in several dramatic pieces: a playbill featured on this page advertises The Garrick Fever, a one-act play in which a provincial theater invites Garrick to perform. The harlequinade is a descendant of 16th-century Italian commedia dell’arte, improvisational comedic plays that featured acrobats as well as actors. While the commedia became popular in England in the 16th century, by the 17th century a distinctly English version began to emerge. By the 18th century, the genre had been reconceived as pantomime with Harlequin, the Lord of Misrule, along with Columbine, Clown, and Pantaloon as the main characters. Originally, these pantomimes were divided into “serious” sections, retelling a story usually drawn from classical mythology, and “comic” sections, organized around the trickery of Harlequin, who often disguised himself and transformed objects and people in his efforts to woo Columbine. The folded story-print is also called a “harlequinade.” First published in Britain in 1765, these flap books were based on harlequinades on stage. The books consist of a sheet with four vertical panels bearing illustrations of episodes in a narrative, with accompanying text verses. Each illustration panel is divided horizontally to make two flaps. The flaps lift to reveal an additional illustration, furthering the narrative. In most cases, the picture on one or the other of the flaps is a continuation of that which is beneath it. Lifting the flap transforms one scene into the next. The reader manipulates the flaps to “act out” the story.